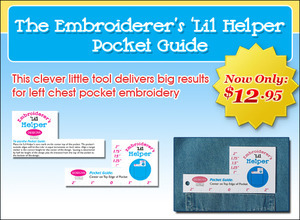 This is a fast and simple tool for positioning embroidery designs above pockets. 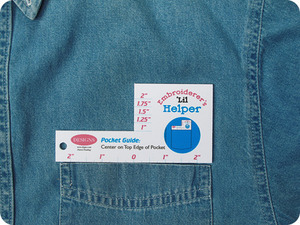 Place the ‘Lil Helper’s zero mark on the center top of the pocket. The pocket’s outside edges will hit the ruler in equal increments on both sides. Align a target sticker with the correct height marking for the center of the design. Determine the design’s center by adding half the design’s height plus the distance from the top of the pocket to the bottom of the design.